“Since you move so much, does it get any easier?” my civilian neighbor asked. How would you answer that question? You’d think moving on a regular basis with this military lifestyle would have our family perfectly organized. In reality? Not so much! With each move, we have a completely different experience. Every. Time. One thing for sure is that MilitaryByOwner has consistently provided my spouse and I helpful guidance, no matter where our destination might be. From the moment we have military orders in hand, we start scrolling through the abundance of MilitaryByOwner property listings. While considering buying or renting a home, we read through the informative resource articles on the MilitaryByOwner website. When we need a reminder of our PCS checklist, we browse the helpful MilitaryByOwner blog posts. When it’s time to sell our property, we download a complimentary ebook or two. Every step of the way, we rely on MilitaryByOwner to ease the stress of a military move. We count on their counsel as we settle into our new location and when it’s time to prepare for our next transition. MilitaryByOwner creates a unique opportunity for those in the military community to connect homesellers with homebuyers and landlords with tenants. The best part? It’s all happening online. You can hunt for your next home from the comforts of your couch! Our vision for MilitaryByOwner is to be the first place a military service member goes to place an advertisement online. We will leverage a powerful existing network. That network encompasses former and present military service members, their families, and the communities that support them. By use of the internet we will “link up” buyers and sellers of homes along with landlords and prospective tenants. We will provide this service at a reasonable price with outstanding customer service. As the wheels of a PCS move start turning, we try to our best to stick to our family budget. MilitaryByOwner understands the need to keep things affordable, and strives to provide each military family the most bang for their buck. As an added bonus, a listing placed on MilitaryByOwner will reach a wide range of followers across various social media platforms. 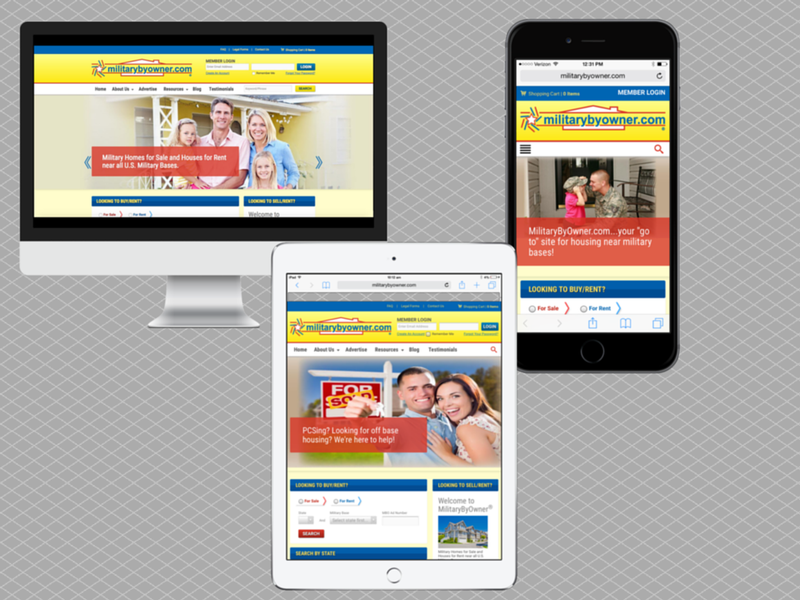 MilitaryByOwner will provide a comprehensive low cost means for military members and their families to advertise their homes for sale or rent. The service will be provided throughout the entire year and will encompass all locations where military members may be stationed to include overseas assignments. MilitaryByOwner will aggressively advertise across the web and other military periodicals as well as leverage web based search engine postings in order to attract military personnel and the general public to this site to ensure success. Recently, I asked the owners of MilitaryByOwner, Dave and Sharon Gran, to tell me a little bit about how they started their business. As if chatting over coffee with a dear friend, Sharon shared with me a personal story. The Grans were stationed overseas and had just received orders to return to the States. During a brief trip back to the U.S., Sharon had a limited time to find the perfect home for their family. Working with an experienced real estate professional, the agent suggested that Sharon jot down notes about each of the many homes that they toured. While keeping a log of potential homes, Sharon thought, “There has to be an easier way!” Then, Sharon and Dave pondered setting up a military-friendly website to ease the challenge of being pressed for time while househunting. By tracking homes online, a military family could compare available properties and define which home would be the best fit without the sense of feeling rushed. Thankfully, this story has quite a happy ending! When it was time for Sharon to hop on a MAC flight back, she had a contract on a house and an innovative business idea in mind. Our number one priority at MilitaryByOwner is to help military families connect during a household move. We believe in outstanding customer service. We encourage our home and business advertisers to reach out to an expansive audience. Each day we move forward - by researching the details of buying and selling real estate, by understanding the trials of moving from one assignment to the next, and by tying it all together for those in the midst of this unique military lifestyle. If military orders come along, and you’re not sure where to start, just click on MilitaryByOwner and browse the tabs and features of the website. Much like what our military family has experienced, a pending PCS can be considerably less overwhelming by simply having access to these premium resources and top-notch information.